So I missed a week of blogging being out sick with the flu, and thank you for all your kind tweets, thoughts and comments. It really did help me feel better! I wanted to share this last week, but I am glad I can share them today instead. I have family scattered all over the U.S. From Boulder and Denver, to Minneapolis and Chicago, with my parents and a few siblings in Oklahoma. So when my family traveled to KC to celebrate turkey day, I knew exactly what I wanted to do on Black Friday! 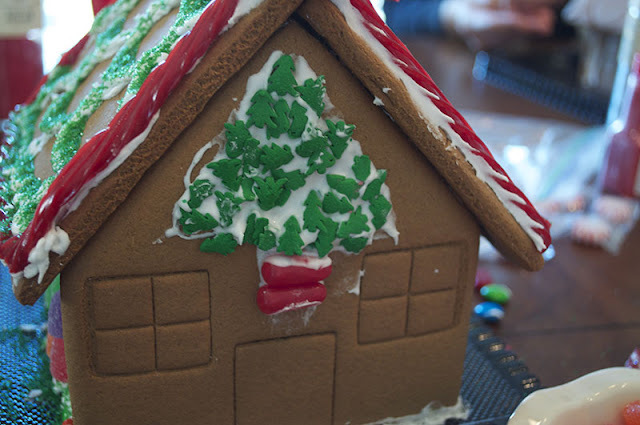 We had our annual gingerbread house decorating event! We paired off co designers to create their own masterpiece and it was so much fun. The boys got a house of their own too! 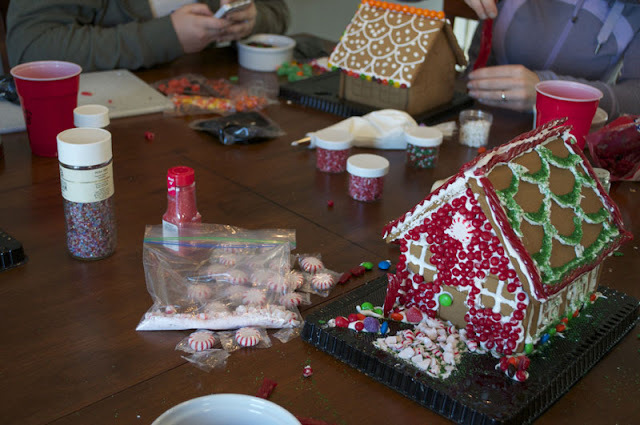 It was fun to watch them go at it, while my nieces were carefully and meticulously placing each and every gumdrop, the boys were a little more daring with the red hots!! It was a successful day and such a fun tradition. 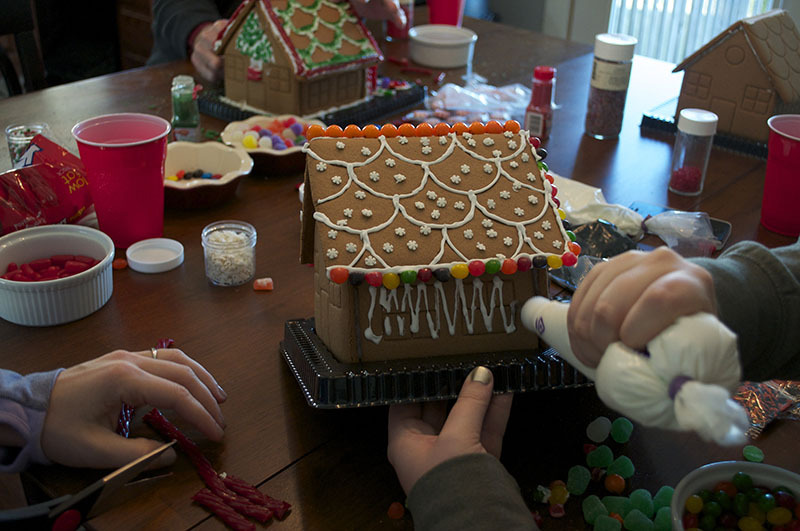 Do you have any family traditions for the holidays that you look forward too? 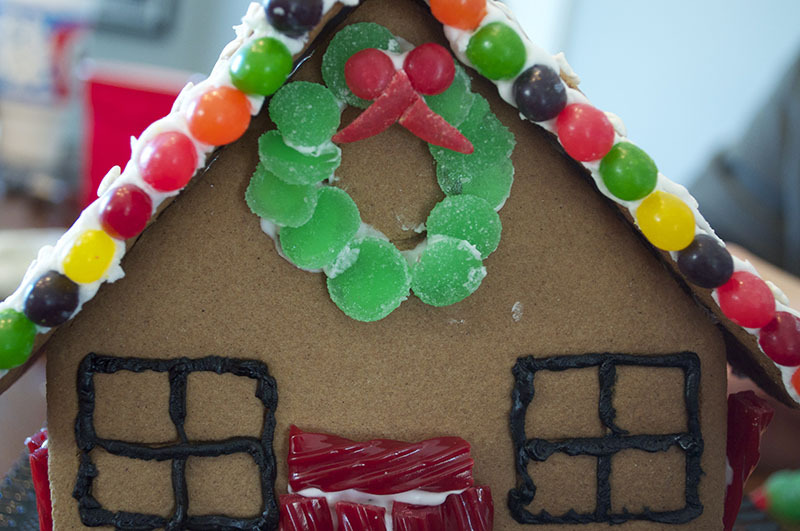 And the boys house covered in red hots! 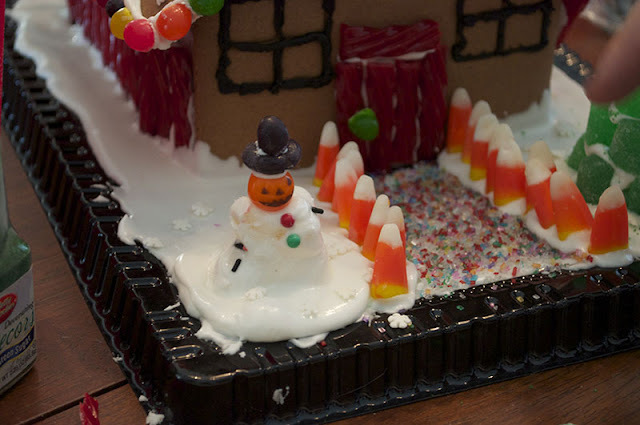 The girls built a cute snowman out of royal icing covered gumdrops with a cute pumpkin face candy! All the houses were adorned with a wreath! There was even a chimney built out of licorice with a gumdrop santa! 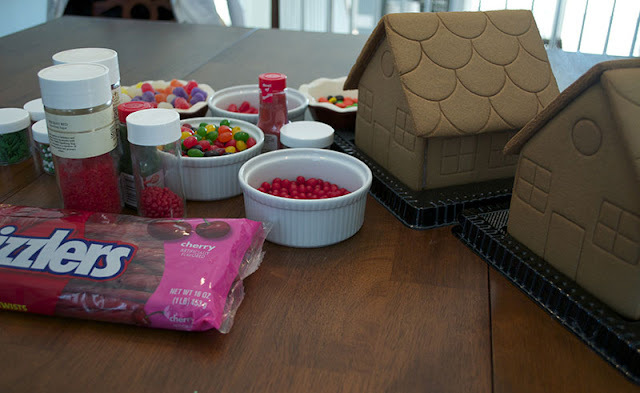 They lasted adorned with their "lights of jellybeans" for ohhh about 3 hours before I noticed one house was bare! That would be a certain 16 year old who decided to undecorate the house!! Geez......Boys!!! 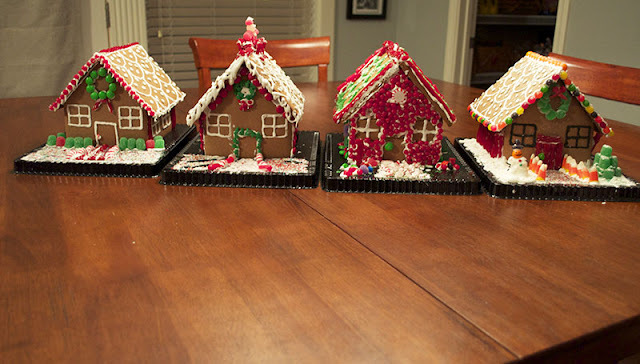 you have NO idea how much i love making gingerbread houses. 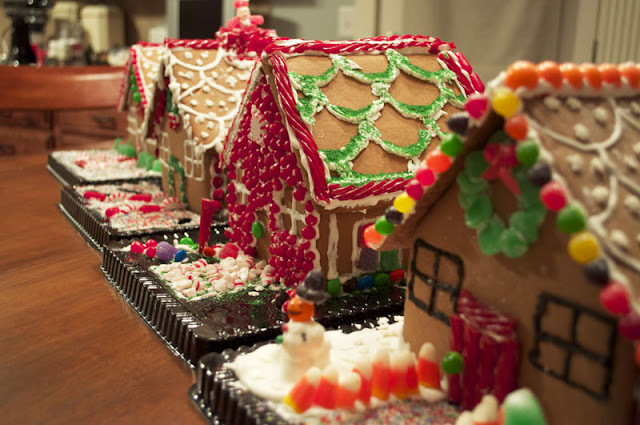 well, i supervise the building and the decorating but obviously all my ideas. hope you're feeling better!!! Why am I not surprised you supervise! Thanks for the well wishes! Those look great! I think I would eat all of the candy before putting them on the gingerbread house! 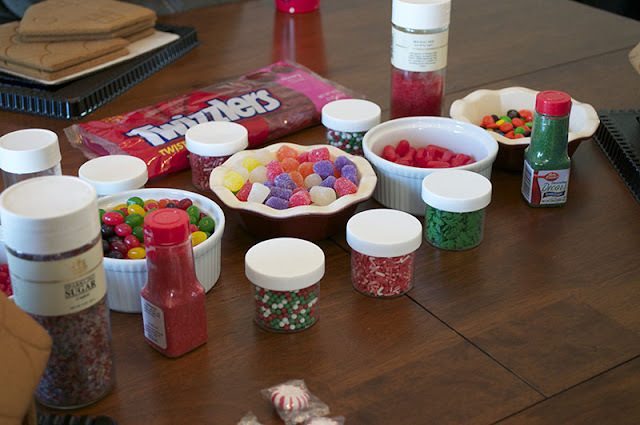 Believe me the boys were eating as much as they were decorating with!